Cosmetic procedures that are marching forward with the advanced abilities of laser technology make it possible to enjoy fast and effective results with the Quadralase CO2 Fractional Laser Resurfacing system. This comprehensive device aimed at raising the potential of cosmetic procedures comes from the designers at Candela and Syneron. The science working behind the equipment that they produce makes taking care of one’s skin a simple process that does not have to become complicated with age. All of their devices have undergone extensive clinical testing, allowing them to produce equipment that guarantees safe and prominent results. Their hardware is used all over the globe and trusted by doctors the world over due to their extreme attention to detail and unparalleled customer support. They are committed to success when it comes to both the goals of their patients and the doctors working with them to expand the potential of their practice. This laser-based system allows for procedures to be performed in as little as 30 minutes, and the patient experiences little to no discomfort as the process takes place. It is extremely popular for implementing skin resurfacing around the neck and facial regions, although, it is rated for use nearly anywhere on the body. The results become apparent only days after the patient has come into the office, offering real change that exceed people’s general expectations. 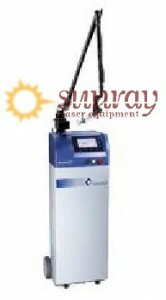 Bringing your patients the very best solution in skin care is as simple as ordering from SunrayLaser.Com. Our refurbished units offer outstanding service that is backed by our knowledge and experience in working with this type of equipment. Contacting us today can allow you to begin offering your patients new options that they may have never thought possible.